Mátyás Bicsák started playing the flute at the age of 9 in the local music school of his home town Székesfehérvár (Hungary), 60 km west of Budapest. 2 years later he already won first prize of the flute category in the national woodwind competition. Over the following years he participated in 3 other national flute competitions, finishing among the prize winners on each occasion. He attended Béla Bartók Music High School in Budapest, where he graduated in 2000 and passed the entrance exam of Franz Liszt Music Academy (for the class of Professor Lóránt Kovács) in the same year. 5 years later he graduated with a Diploma with Distinction. He also studied computer science simultaneously at Eötvös Loránd University and graduated with a Diploma. 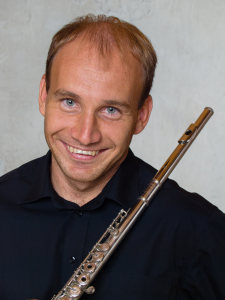 In 2001 he won second prize at the Kuhlau International Flute Competition in Uelzen (no first prize was given in that competition); In 2003 he was awarded special prize for the best Hungarian candidate in the Budapest International Flute Competition – a handmade silver Muramatsu flute. He continued his studies in Munich as a scholarship holder of the DAAD (German Academic Exchange Service), his teacher here was András Adorján. During this period he also completed his studies in computer science at the Munich University of Applied Sciences, graduating with a Master’s Degree (M.Sc) in Computer Science with the overall classification “very good”. He was member of the Karajan Academy of the Berlin Philharmonic Orchestra between 2007 and 2009, his professor was Andreas Blau. In the course of the tours with the Berliner Philharmoniker he played in some of the world’s most renowned concert halls like Suntory Hall (Tokyo), Salle Pleyel (Paris), Tonhalle (Zurich), Musikverein (Vienna) under such famous conductors as Sir Simon Rattle, Zubin Metha, Gustavo Dudamel, Daniel Barenboim, Cristoph von Dohnányi and others. In 2008 and 2009 he took part in the Santander Summer Festival and played first flute in the festival’s orchestra. He was also participant of the Moritzburg Festival Academy (2008). He has been the first principal flutist of the Hessian State Opera in Wiesbaden (Germany) since 2010. 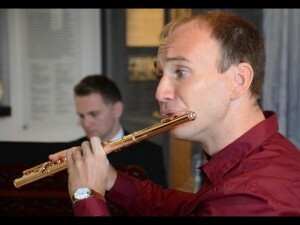 Mátyás Bicsák plays a hand-made 14k Brannen-Cooper rose gold flute.